The proliferation of smart device usage and the growing trend of bring-your-own-device (BYOD) in several leading telecom and IT companies have greatly influenced the IT asset management (ITAM) software market. ITAM software was initially preferred by large enterprises for the maintenance and reduction of risks associated with IT compliance and licensing management. Over time, these solutions have gained recognition among SMEs across the globe as an effective solution to balance spending with return on investments. 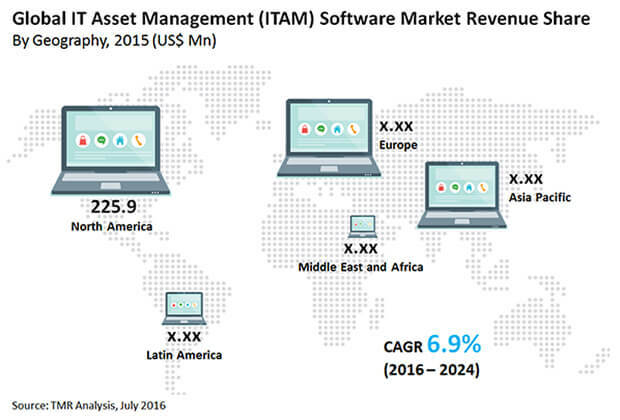 The ITAM software market is projected to reach a value of US$1.3 bn by 2024, rising from US$708.9 mn in 2015. The market is estimated to expand at a steady CAGR of 6.9% during the forecast period from 2016 to 2024. By size of enterprise, ITAM software finds application in large enterprises and small and medium enterprises (SMEs). Large enterprises currently hold the majority in terms of revenue, while SMEs are likely to register the fastest growth over the course of the forecast period. By type of deployment, the ITAM software market is segmented into on-premise, cloud, and hybrid. Cloud-based services are the key contributors to the revenue of the ITAM software market, accounting for an almost 50% share in the market by 2024. ITAM software is used in a number of end-use industries, including banking, financial services, and insurance, transportation, manufacturing, telecom and IT, government, healthcare, and energy and utilities. Among these, the telecom and IT sector leads the ITAM software market, while the energy and utilities sector is projected to expand at the fastest pace over the coming years. The global ITAM software market comprises North America, Latin America, Asia Pacific, Europe, and the Middle East and Africa. North America presently leads the global ITAM software market owing to the enormous growth of the IT industry and growing awareness regarding the advantages of ITAM. North America is anticipated to retain its lead in the ITAM software market during the forecast period thanks to the surge in government regulations and strict software audit policies. The increasing demand for centralization and automation is also influencing the growth of the ITAM software market in this region. Organizations have been emphasizing on the reduction of operational expenditure by cutting down expenses in IT asset management through the deployment of ITAM software. At present, the ITAM software market in Asia Pacific is driven by countries such as India, China, South Korea, Singapore, and Japan. This region is anticipated to record the fastest growth in the coming years due to the rising interest of investors in this region and the growing establishment of SMEs. As the adoption of cloud-based solutions in Asia Pacific rapidly increases, the number of smart devices is expected to rise, aided by improved communication technologies such as 4G LTE. Unlike larger corporations that adopt cloud technologies to save cost and improve efficiency, SMEs in this region seek a wider reach, enhanced agility, and the flexibility and ability to serve larger customer bases at a lower investment. ITAM software has been aiding SMEs in this very task. Some of the key players operating in the global ITAM software market are IBM Corporation, Oracle Corp., Hewlett Packard Enterprise Development LP, BMC Software Inc., ServiceNow Inc., BDNA Corporation, LANDESK Software, Aspera Technologies Inc., Cherwell Software, Flexera Software LLC, CA Technology Inc., and Snow Software. IT asset management (ITAM) software solutions are useful for organizations for asset inventory management both hardware and software, better manage their computer hardware and software inventory, diagnose and prevent IT and regulatory risks to various technology components, and relate assets to financial records and contracts such as equipment leases and software licenses. As per the study presented by expert analysts, the world IT asset management software market could be segmented based on the size of enterprise, type of deployment, end user, and geography. Small and medium enterprises (SMEs) and large enterprises are envisioned to be the key segments in terms of size of enterprise. The study on the global IT asset management software market compiled by seasoned analysts presents a comprehensive analysis of every possible aspect that could influence the market’s growth over the forecast period. Included in this report is a review of macro and micro factors that are important for existing market players as well as for new entrants. The growth of IT asset management software market is likely to rise expeditiously on the back of proliferation of smart devices and growing bring-your-own-device (BYOD) practices in the telecom and IT sector. Asset inventory management is important for organizations to keep a check on software purchased, if it is being properly utilized, and for a need of upgrade software and operating system. ITAM software has been useful to identify malicious or illegal software installation across platforms, to prevent vulnerabilities, and ensure compliance with corporate security policies. With rising emphasis to adhere to security and compliance policies, the ITAM software market is receiving a boost. Apart from this, the need for centralization and automation of IT infrastructure is driving the adoption of ITAM software. Companies are increasingly vying for consolidation and are focused on streamlining and centralizing IT operations. This is likely to impact the growth of ITAM software market to some extent. On the down side, cost-cutting targets and objectives to reduce operational costs are limiting the deployment of ITAM software in organizations. Large enterprises are anticipated contribute immensely to the growth of ITAM software market; the segment is likely to hold the leading market share of over 60% by 2024. SMEs, on the other hand, are likely to surpass in terms of growth rate between 2016 and 2024. The enormous growth of the IT industry and rising awareness about the advantages of ITAM are key factors behind the lead position of North America IT asset management software market. The surge in government regulations, strict software audit policies, and rising practices of centralization and automation of IT infrastructure could augur well for the growth of this region in the upcoming years. Organizations are increasingly deploying ITAM software to cut down IT asset management expenses in a bid to reduce operational expenditure. At present, India, China, Singapore, South Korea, and Japan are primarily driving the Asia Pacific ITAM software market. Rising investments and surge in the number of SMEs are some key factors that will account the region to display leading growth rate over the forecast period. Some of the key companies operating in the global IT asset management software market are IBM Corporation, Hewlett Packard Enterprise Development LP, Oracle Corp., ServiceNow Inc., BMC Software Inc., LANDESK Software, BDNA Corporation, Cherwell Software, Aspera Technologies Inc., Flexera Software LLC, Snow Software, and CA Technology Inc.